Courts • Case still tentatively set to be heard in spring 2011. File photo | The Salt Lake Tribune Curtis Allgier is charged with capital murder and seven other felonies for the June, 25, 2007, slaying of 60-year-old prison officer Stephen Anderson, who was killed with his own gun while taking Allgier to the University Hospital for an MRI. A 3rd District Court judge has found no basis to appoint a new defense team for prison inmate Curtis Allgier, accused of killing a Corrections officer four years ago. Francisco Kjolseth | Tribune file photo Curtis Allgier is charged with capital murder and seven other felonies for the June, 25, 2007, slaying of 60-year-old prison Officer Stephen Anderson. 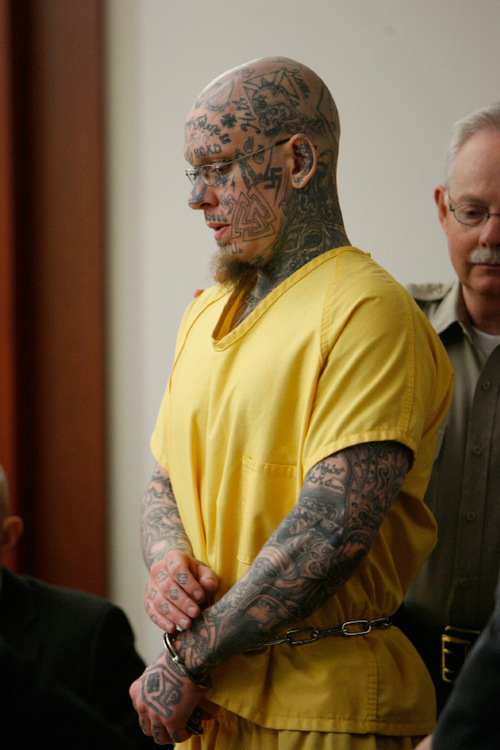 Allgier's lawyers want his tattoos covered up during his trial to avoid prejudicing the jury. Defense attorneys on Wednesday assured a 3rd District Court judge that a make-up artist will need just 10 minutes to cover Curtis Michael Allgier's numerous tattoos and make them invisible to jurors, not hours as the judge had envisioned. 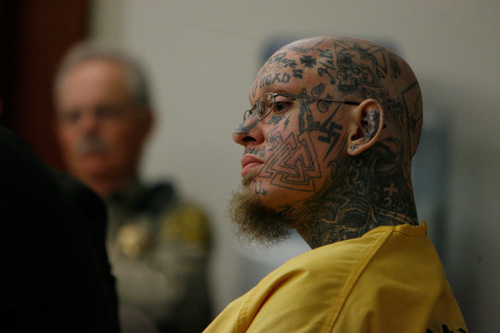 The defense is afraid the murder suspect's head-to-toe tattoos  which include swastikas, neo-Nazi symbols and the words "Skin Head" written across his forehead  could negatively influence a jury. Judge Paul Maughan will not decide until later this month whether to allow Allgier to cover up during the first part of his trial, where the jury will decide whether he is guilty. But Maughan told the defense Wednesday that if Allgier is found guilty of killing 60-year-old Corrections Officer Stephen Anderson, he will not allow the use of make-up during the second part of the trial  the penalty phase where the jury will decide whether to impose the death penalty. At that point in the trial, Maughan said, "the state has a right to show Mr. Allgier as Mr. Allgier." The judge's pronouncement seemed to cause the defense to reconsider the wisdom of hiding Allgier's prison ink. Said defense attorney Ralph Dellapiana: "If the jury is going to be surprised [by Allgier's tattoos] halfway through, then maybe it's not an effective strategy to cover them up at all." The Salt Lake County District Attorney's Office has filed a motion opposing the use of make-up, claiming the tattoos are relevant for purposes of identifying Allgier. Utah court rules say a defendant should appear in court appearing approximately as he did at the time of the alleged crime, according to prosecutors. They also argued other courts have found visible tattoos were not necessarily prejudicial to a defendant. Prosecutor Robert Stott called the idea of using a make-up artist to hide tattoos was "a first ... it's unique." Allgier, 31, is charged with capital murder for allegedly killing Anderson with his own gun after Anderson unshackled him for an MRI scan June 25, 2007, at a Salt Lake City medical clinic. Attorneys told Maughan three months ago they expect to be able to try the case in the spring of 2011. But new issues keep cropping up. Dellapiana said his team expects to file another 40 motions, including a motion asking the judge to stop Salt Lake County jail personnel from interfering with Allgier's attorney/client privilege. Dellapiana said jailers have been "surveilling" their meetings with Allgier, and reading Allgier's mail dealing with legal issues. The defense also wants the jail to provide 726 videos of Allgier being taken from his cell each day. Dellapiana said the tapes deal with the question of whether Allgier can be managed in a correctional setting, and may be crucial to the jury's deliberation on whether to impose the death penalty. "His life may depend upon it," said Dellapiana, adding Allgier is "a model inmate and can be safely managed in an institutional setting." Meanwhile, the Utah Supreme Court is deciding whether a letter written by a former Utah State Prison inmate that contains information about Allgier can be unsealed and released to the public. The defense has expressed concern that publicity about the letter's contents, penned by Brent Mayon Cobb, would jeopardize Allgier's right to a fair trial. Following a three-day preliminary hearing in March, Allgier was bound over on one count of capital murder, as well as charges of seven other felonies connected to Allgier's short-lived escape, which ended when a citizen disarmed him during a struggle inside an Arby's restaurant.